The United Kingdom “should be more confident about [its] status as a Christian country,” Prime Minister David Cameron wrote in a recent opinion piece published before Easter. Both may be correct, depending on the data source. By one definition, England, at least, is a Christian nation: The Church of England is the official state church of England. Looking at the religious affiliation of the population, however, a more complex picture emerges. 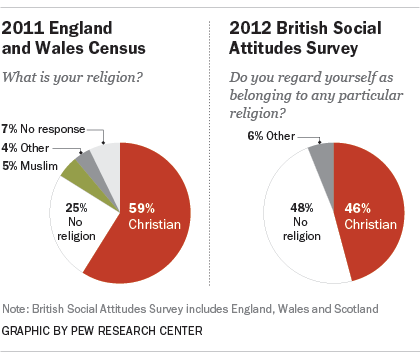 There are different ways to measure the U.K.’s religious makeup. A majority of the population identifies as Christian, according to 2011 census results. But some surveys, including the 2012 British Social Attitudes survey (which uses different question wording), find a lower level of affiliation with Christianity. The 2011 census in England and Wales (home to more than 85% of the U.K.’s population) found that, in response to the question “What is your religion?” a majority (59%) of the population said Christian. Separate censuses were conducted in the same year with a different question – “What religion, religious denomination or body do you belong to?” – in Scotland, where 54% identified as Christian, and Northern Ireland, where a higher share (82%) said they are Christian. In each of the three cases, about 7% did not answer the question. But in the 2012 British Social Attitudes survey – which surveyed people ages 15 and older in England, Wales and Scotland and asked “Do you regard yourself as belonging to any particular religion? If yes, which one?” – a much higher share (48%) said they have no religious affiliation. The survey found the Christian population was less than half (46%) of the total. While question wording likely plays a role in the significant differences between the U.K.’s censuses and surveys, there also may be other factors. For example, question order may affect results; the religion question on the England and Wales census followed a question about ethnicity, while the ethnicity question came after questions about religion in the British Social Attitudes survey. There also are differences in data collection methods, such as the census being conducted primarily online and on paper and the survey being conducted via face-to-face interviews.